This Easter Sunday dawned much like most others in bygone years, and eras. 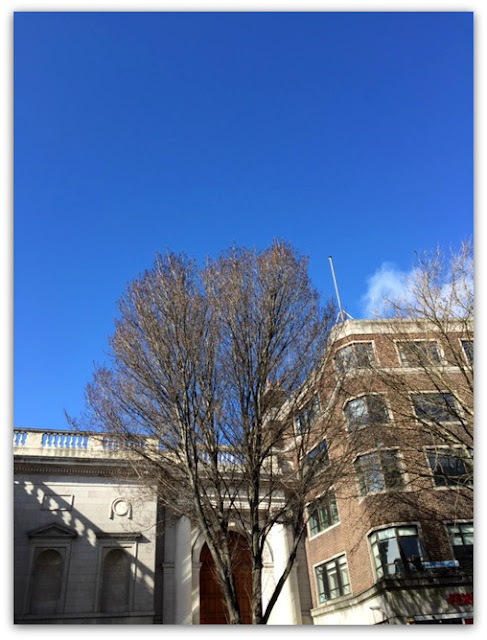 Lovely sunshine infused with the coldness of a fresh spring-time air. 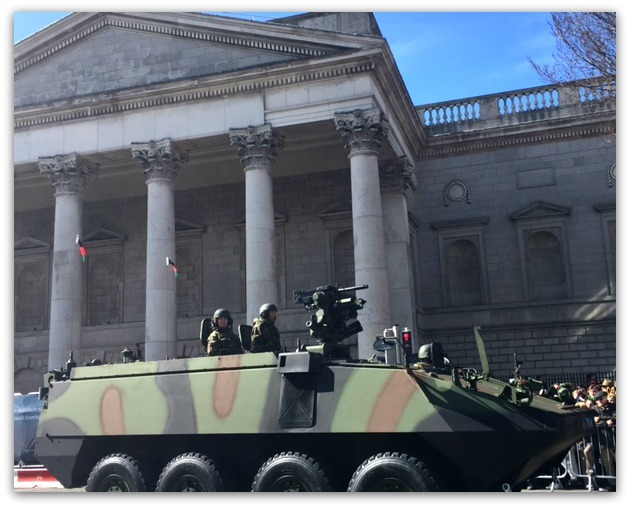 Yet this Easter Sunday in Ireland was very different to most. It was one hundred years ago to the time of year - given that Easter falls on different dates each year - that a band of patriotic Irish men and women took up arms and a strong stance against British rule. And they stormed the G.P.O. (General Post Office) in O'Connell Street, Dublin's main and very beautiful thoroughfare; known as Sackville Street back then. 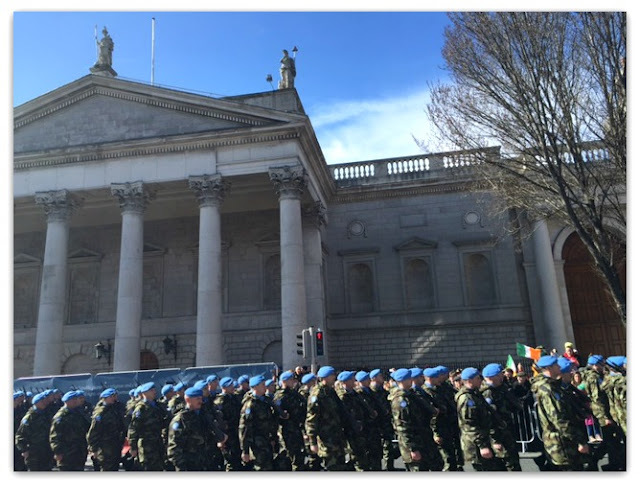 And so the Easter Rising 1916 began. Note: The 1916 Rising was planned for Easter Sunday but due to the capturing of arms en route from Germany it was cancelled, a decision was then taken to go ahead on Easter Monday, the actual date being April 24th 1916. There will be more commemorations on that date. Fast forward to Easter Sunday in 2016 and Irish men, women and children rise in their hundreds and thousands. 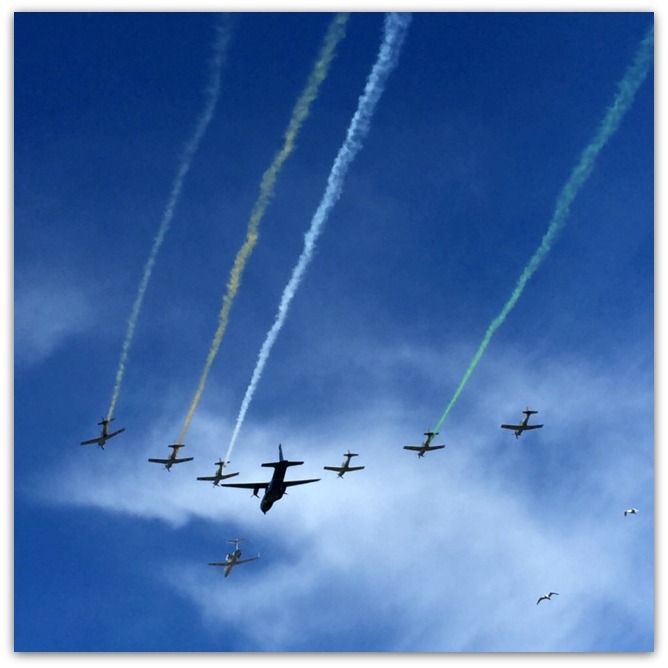 To flock to the streets feeding into O'Connell Street, to commemorate those brave men and women of one hundred years hence; who fought so valiantly and courageously to start a process that ultimately led to the freedom we enjoy today. It would be 1922 before 26 counties of our nation would be declared the Irish Free State. 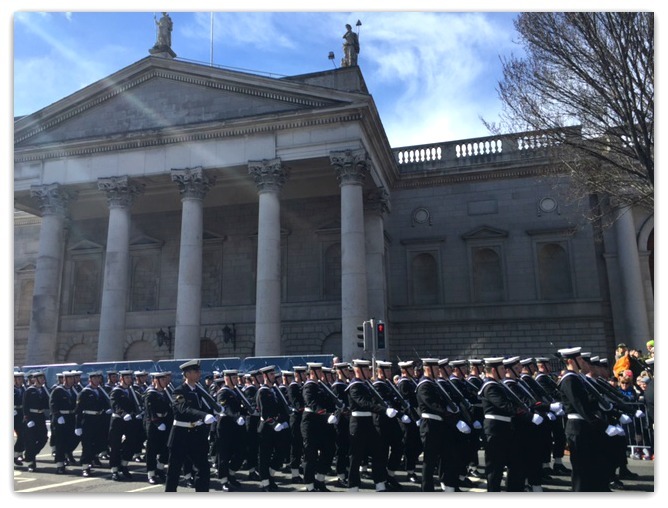 Ireland kick-started our commemorative events, of which there are many, with a dignified, impressive and at times emotional national parade. 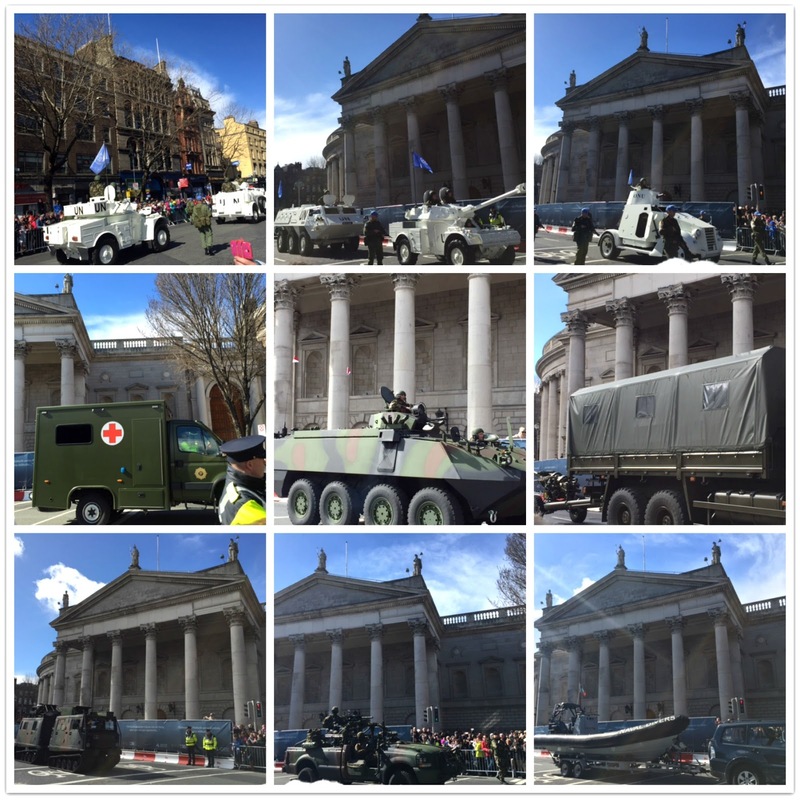 Which included 3700 members of the Defence Force, Gardaí and emergency services. I am proud and honoured to say that myself and my 16 year old son joined the massive crowds that thronged the streets that day. 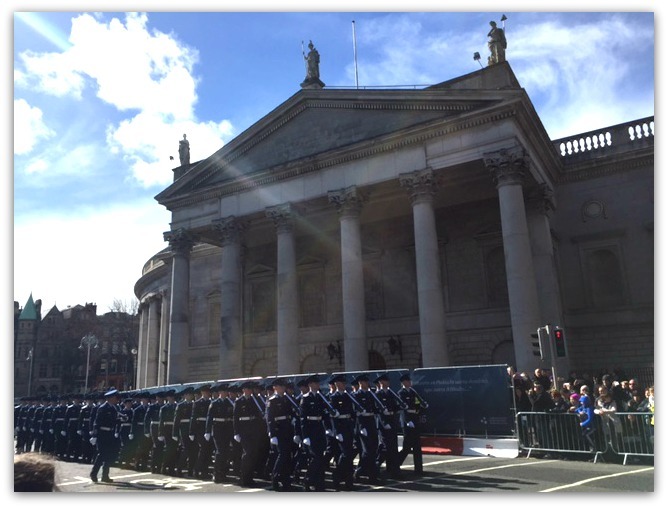 A memory I hope that he can pass on to his children and grand-children at the 150th commemorations! We were very cold, despite being enveloped within the hordes of fellow attendees, and tired from the hours of standing around. But far less uncomfortable than those of 100 years ago, as I pointed out to him. I also reminded him that there were boys of his age, and slightly younger, who signed up and took part in the Rising! A far cry from the cossetting most - but sadly not all - of our children receive today. And cold though it may have been there was a stunningly blue sky draping our lovely Fair City for this most momentous day. A suitably solemn pipe band and some flag bearers were one of the first to arrive, heralding what was to come. 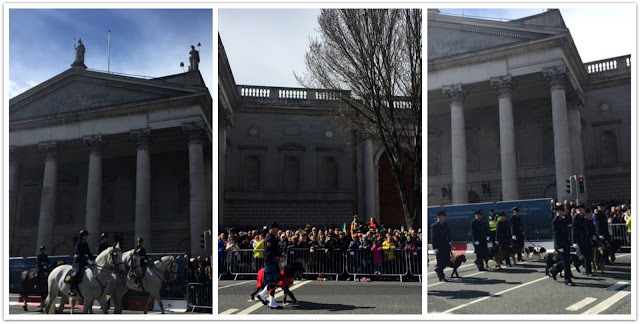 When our dignitaries, VIPs and 1916 descendants were seated at the G.P.O. and after some flag ceremonies and wreath-laying at important historical sites pertaining to 1916 e.g. 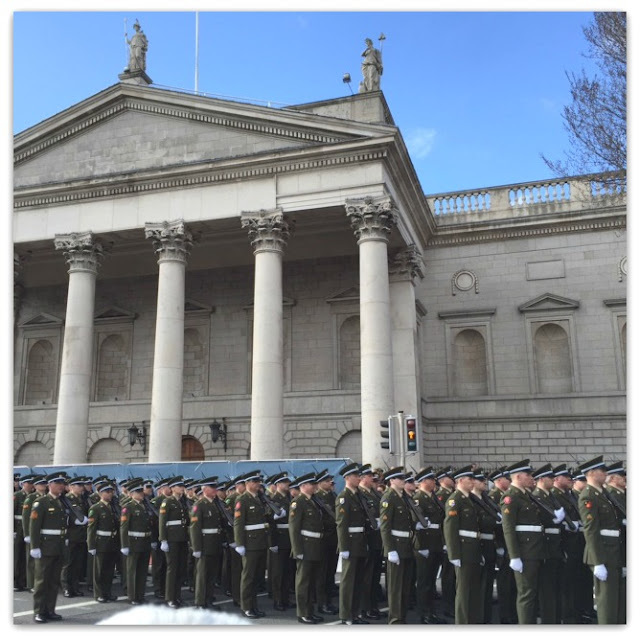 the Royal College of Surgeons and Dublin Castle, there followed some emotional ceremonial duties. Our President laid another wreath at this site of most importance and prayers were said. There was a minute's silence and it was extraordinarily eerie to be part of hundreds and thousands of mostly silent people lining miles of footpaths. Music was played, including an emotional rendition of 'Danny Boy' (my late father's favourite song) 'The Last Post' and finally our National anthem. Of course the moment of importance was the reading of The Proclamation. One hundred years after the first time it was read out. A truly momentous moment. 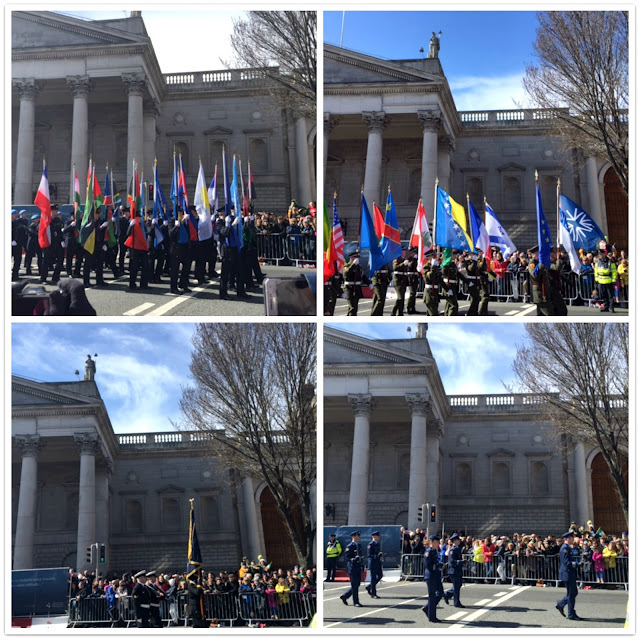 There were lots of flag-bearers and some sword-carriers too..... we were most impressed by that! 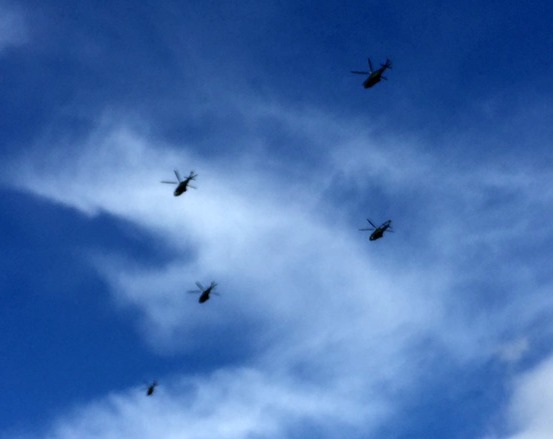 They took to the air as well with a 'Giant Bees' army helicopter display! Throughout the parade I couldn't help but wonder what the men and women of 1916 would make of the numbers comprising our Defence Forces, and the equipment and vehicles they have at their disposal, today? Would they be pleased that, as a nation, we have matured and our forces continue our neutral stance, and mainly assist in peace-keeping missions throughout the world? I'd certainly like to think so. They may be concerned though that the '....equal rights and opportunities to all citizens...', the promise to 'pursue the happiness and prosperity of the whole nation...' and the 'cherishing all the children of the nation equally' as stated in The Proclamation, remain works-in-progress. They may also have been saddened by a small, parallel protest of homeless families on the day - including people in employment - that are being housed indefinitely in hotel rooms. And that's not as glamorous as you might think. But we haven't forgotten them, these men and women of 1916, and the sacrifices they made. In extremely difficult times. At the time of the Easter Rising Britain was heavily involved in World War 1, ultimately for the freedom of all. But ironically at home they had a rising to contend with from a nation they wished to remain under their rule, but who wanted their freedom from Britain. 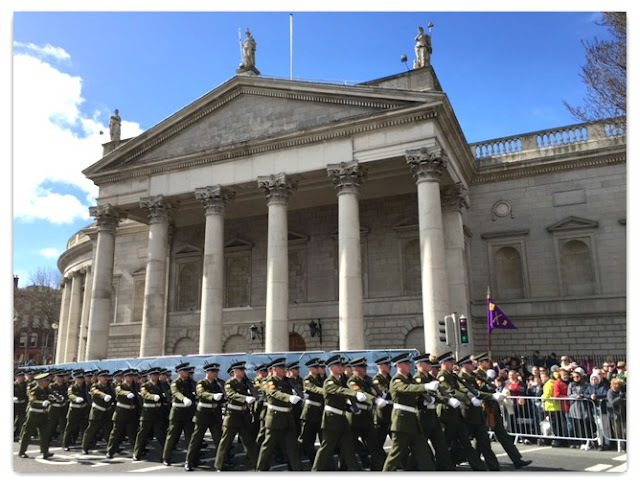 To complicate matters Irish men, with large families and many mouths to feed, fought in the British Army in WW1. They were very complex times and I simplify here, I know. My intention is to give but a flavour of these times and how important this centenary is to us, particularly for any over-seas readers. I must admit to not being more knowledgeable on our Irish history. It was never presented in an interesting fashion in my school days you see. My hope is that the centenary commemorations this year, and in the years that follow as there are many historical events to commemorate, will present the information in a more digestible fashion for our children. A number of some wonderful TV documentaries etc., have been produced giving a more humanised report of these times. 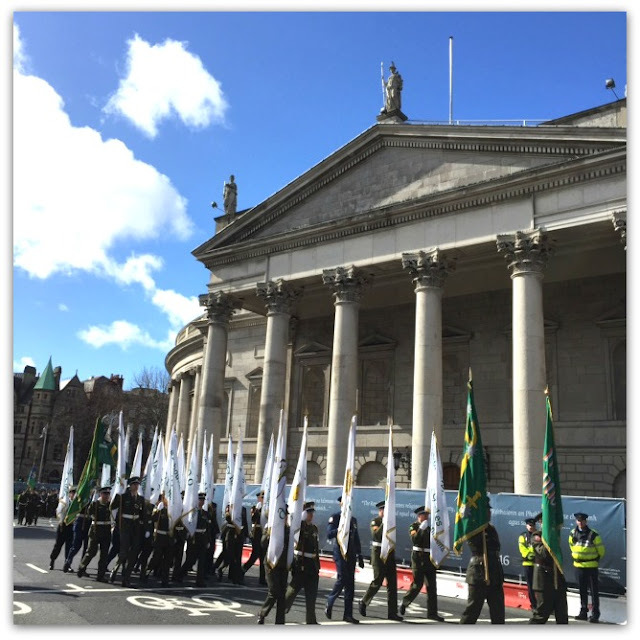 Altough we honoured them this Easter weekend the men and women of 1916 were not heroes overnight and they faced the onslaught of the public at first. Sackville Street and many buildings were destroyed and of the 500 who were killed 54% were civilians (including children, and babies). It was only when the British Army, under the command of General Maxwell sought swift retribution by sentencing 16 men to their deaths that the tides of support changed. It was excessive and brutal but ultimately made them martyrs. Watching and reading material from these times makes me a little angry, I'm afraid to say. But we have moved on. Both our nations, through some forward-thinking and open-minded leaders that came along as the years unfolded, found a way towards a working peace and reconciliation. That is as it should be in a forward-moving and ever-maturing society. I hope we do our 1916 ancestors proud in that respect. I believe that we should look back in appreciation, acknowledgement and patriotism, but not in anger. And we should look forward in a continued open manner, working on all aspects of our society; always striving to make this the best and inclusive nation we can be. The Proclamation may be one hundred years old but it's words are still relevant today.